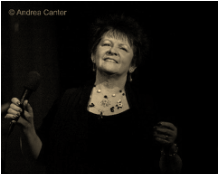 Vicky Mountain’s warm tone, love of the lyric, and entertaining stage personality have charmed audiences since the 1970s. Her eclectic past runs the stylistic gamut from avant-garde theater performances to co-writing and performing original jazz operas, from concerts in Winnipeg to South America, from nightclub performances with duos to big bands. Currently she is the TCCAN Education Committee Lead. She works as a freelance singer and teaches jazz and popular styles voice at MacPhail Center for Music in Minneapolis. Her CDs Birds of a Feather (1994), Don't Go to Strangers (2005), and Sincerely Yours (2009) feature her original lyrics and some of the best musicians in the Twin Cities. Vicky loves the outdoors -- whether in the garden or hiking in the hinterlands -- and her family which includes two grandchildren.